Otto Virtanen began his music studies on the piano with Vesa-Matti Tastula at the Ylä-Satakunta music school at the age of six. He has been studying the bassoon since the age of 15 with Stig Forsman at the Tampere Conservatory, with László Hara and Jussi Särkkä at the Sibelius Academy, with Asger Svendsen at the Danish Royal Academy of Music and with Pascal Gallois at the Paris Conservatory. He completed his diploma examination with excellent marks in 1997, completed his Master of Music degree in 2000 and gave his début recital in the Sibelius Academy concert series in spring 2002. 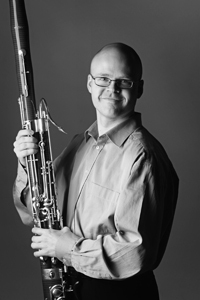 He played bassoon with the Helsinki Philharmonic from 1995 to 1999 and with the Tampere Philharmonic from 1999 to 2004. Since autumn 2004, he has played 1st principal bassoon with the Finnish Radio Symphony Orchestra. In addition to his work in orchestras, he is an active chamber musician; he plays with several ensembles, the oldest of which are the bassoon trio VITAL BASSOON, the Zagros and TampereRaw contemporary music ensembles and the Idée Fixe wind quintet. In these contexts and in his recitals with pianist and composer Kirmo Lintinen, he has collaborated with a number of Finnish composers and performed several world premieres and Finnish premieres. His repertoire is extensive, spanning the history of music from the early Baroque to today. Otto Virtanen has appeared as a soloist with Finnish orchestras, performing both world premières and more traditional repertoire. He has made recordings for the Finnish Broadcasting Company and has appeared at many Finnish music festivals. He has also arranged and written music for a variety of ensembles, usually involving woodwind.